Adam overslept this morning, so we are heading out to the late service today. I, on the other hand, got up and got ready for the early service. I was, therefore, left with a few extra hours on hand that I hadn’t planned on. I went into the kitchen to make a pot of coffee, and wound up also making a pot of grits, a side of gravy, and two loaves of zucchini bread. So, I’m feeling a little P31 this morning. Proverbs 31:10-31 speaks to “A Wife of Noble Character”. I’m not saying that I’m there yet, but it’s always somewhere in the back of my mind – a goal that I will always be striving to attain. And on that topic of zucchini bread, here’s a little recipe for you. 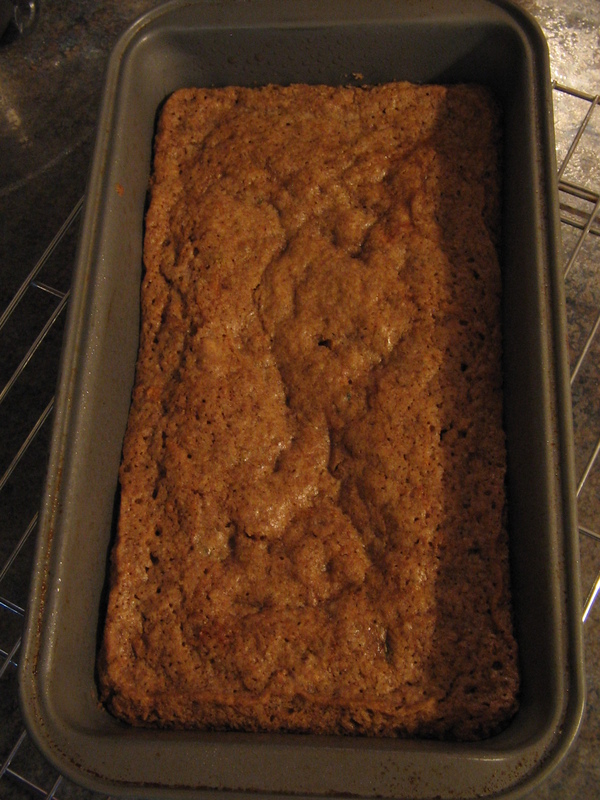 This is a vegan version of the zucchini bread recipe that was printed in the 1996 Newberry Associate Reformed Presbyterian Church’s cookbook. The original recipe belonged to Mrs. Frances Goethe, but it has been altered to comply with a vegan diet by me. In a medium bowl, whisk together flax meal and water and set aside to let stand for at least 2 minutes. In a large bowl, sift together dry ingredients. Add nuts. To the flax meal, add oil, sugar, zucchini, and vanilla. Mix lightly, but well. Add this mixture to the sifted ingredients, and mix until just blended. Bake at 325 degrees for 1 hour in 2 greased and floured loaf pans. *The original recipe just called for 3 cups of plain flour, so you can certainly use that if you don’t have any whole wheat. * I used walnuts because that’s what I had on hand. I’m a big fan of using whatever you have on hand! *I think if I make this recipe again, I’ll go for one loaf with a longer bake time. These two loaves just seem a little short to me. 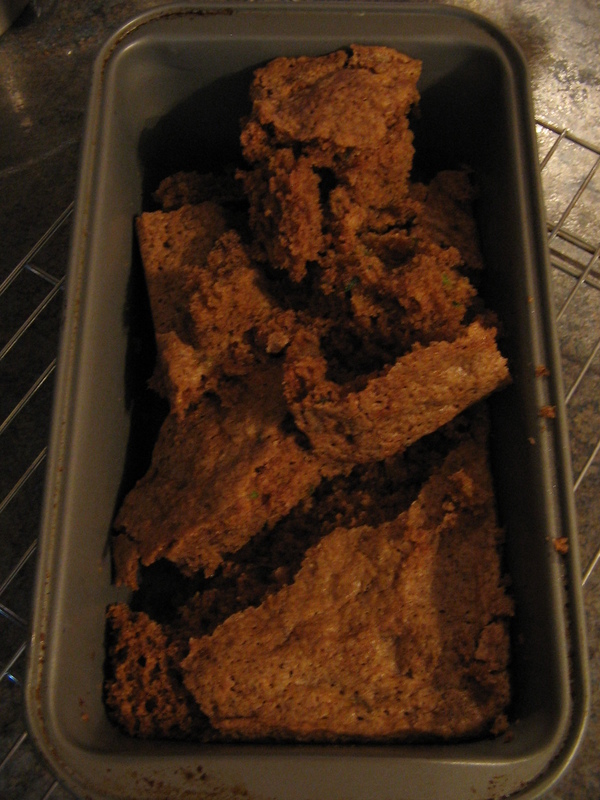 …here is how the first loaf ended up when I tried to turn it out from the loaf pan too soon. Please allow the bread to cool completely before trying to remove it from the pan, or this could happen to you too! Oh well, like I said. P31, still a work in progress. 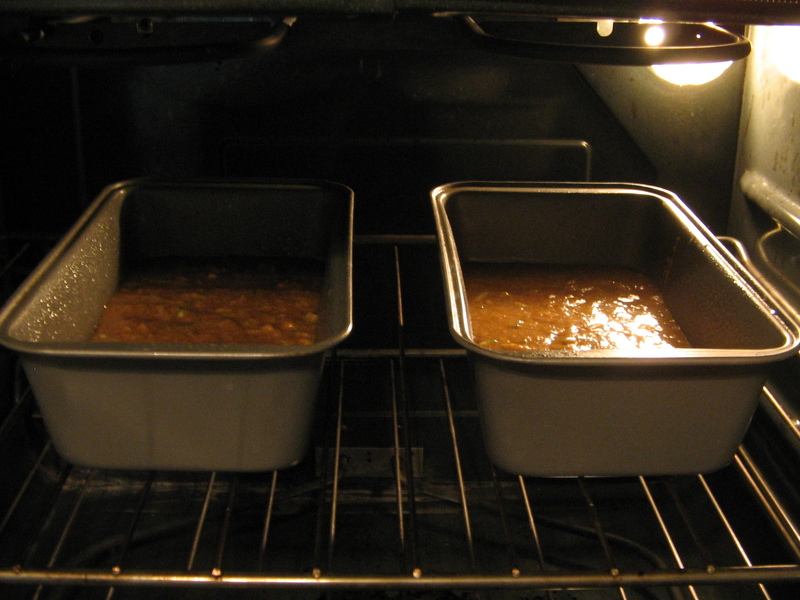 4 Responses to "Sunday Scripture Snippet – P31"
Baking is so much fun! I love the way the smell alone transforms a house into a home. Thank you for this link to your blog from the team CAC thread! I completely agree! I would much rather have something baking in the oven than burn a sugar cookie scented candle, too. You can’t eat a candle. At least, I wouldn’t recommend it. I’m just wondering how that 2 c. cugar tasted in the bread. And where ever were you able to find it?! Oh no! Thanks for pointing that out – I’ll fix it right now.